We love to welcome new members of the Christian family through baptism. It is never too late to be baptised! So whatever the age of the child or the adult, we are delighted that you are thinking to have your child baptised or to be baptised yourself. Baptisms in the Shoreline Benefice normally happen during a family service, so that the gathered church family can welcome the new member of their family. The promises that are made during the baptism service by parents and godparents or by those who can speak for themselves are not to be taken lightly. For your child, baptism marks the start of a journey of faith, which involves becoming a member of the local and worldwide Christian family. As parents you promise to support your child on that journey. If you are not regular worshippers already, you may wish to come and worship with us so you can find out about this family you are about to join. For people who would like to come to church to thank God for the gift of their child, but who are not sure they can commit to all the baptism service asks for, we can organise a special service of thanksgiving. To make sure the date for the baptism suits both you and us and that we have a priest available to take the service, it is important you contact us several months in advance and before making any other definite arrangements for the rest of the day. 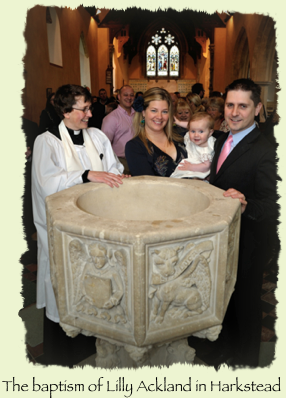 Please know that we cannot guarantee your child will be the only child baptised on the day. There are no charges for a baptism service or for a service of thanksgiving. 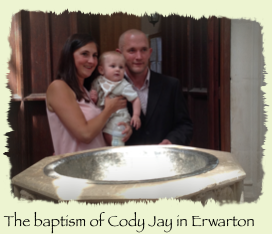 Please contact your local baptism visitor or the rector for information or to make an appointment for a visit. Copyright The Shoreline Benefice 2015 - 2017. All rights reserved.